maximize the health of their heifers as dairy replacements are the foundation for genetic progress and improvement of the herd. feeding systems. It was determined the cost to raise a calf on an automated group feeding system to be $6.35 per calf per day as compared to $5.84 per day to raise a calf on an individual feeding system. But what management practices do these numbers represent? To help correlate health and management practices to calf rearing costs, a Pre-Weaned Calf Health Management Survey was conducted simultaneously with 12 of the 26 ICPA participating farms. feeding system utilized, and represented various dairy farm sizes across Wisconsin. 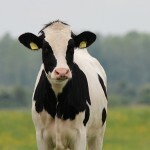 to 1,100) cows for farms which utilized an individual calf feeding system. To find out more details related to the management practices related to feeding, labor and management, and health and the cost associated with those practices, please visit Find the Balance-Management of Calf Health Versus Cost of Production.